This is an English Art Deco period travel poster commissioned by Southern Railways for Folkestone, created by the renowned artist Verney L. Danvers in 1934. 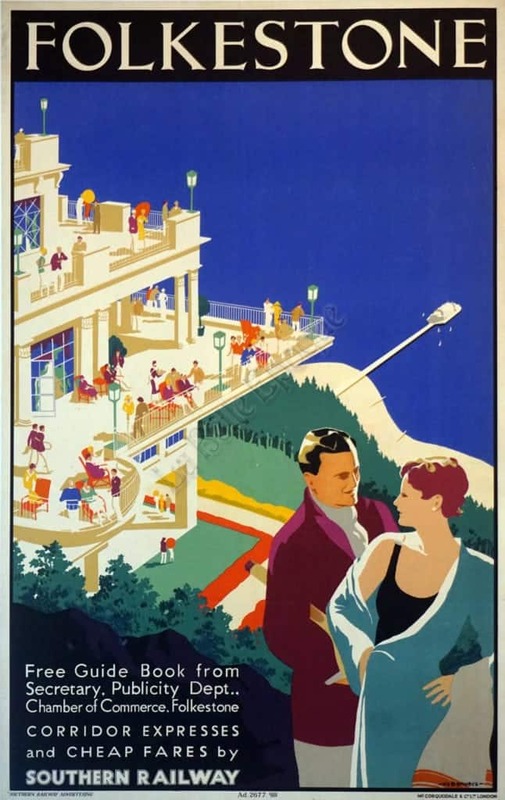 This poster features Danvers’ exemplary Art Deco style, but it also highlights his incredible ability to transport viewers to the chic seaside with exotic and bright colors. A handsome couple stands in the foreground of the scene, behind them the crown jewel of Folkestone, The Leas, a resort with a green grassy clifftop and stunning views of the blue sea. This is an exceptionally well crafted poster with all of the stunning hallmarks of the British Art Deco travel poster. Verney L. Danvers (1895 – 1973) was an English artist whose work is held of the permanent collections of many institutions, including the Museum of Modern Art in New York City.